O Dodder, Where Art Thou? Well, on a recent odyssey to Pennsylvania, dodder was along a streamside bank, in small amounts amongst a lot of knot. Dodder as in Cuscata, a parasitic plant in the Convolvulaceae (morning glory family). 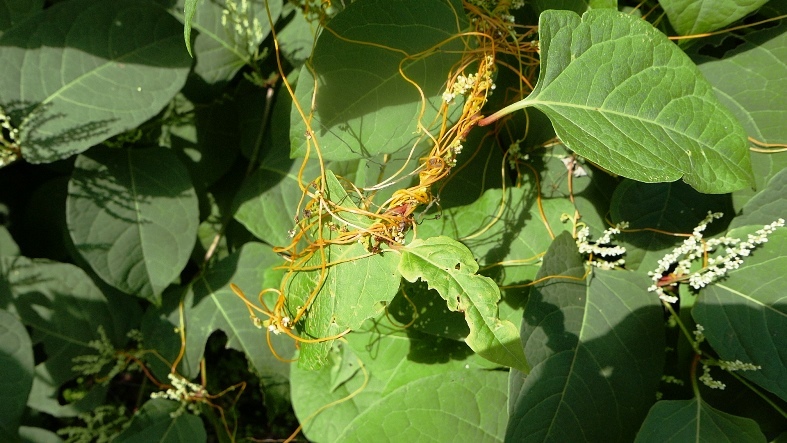 Knot as in Japanese knotweed, or Fallopia japonica, touted as one of the most pervasive invasive weeds in the eastern United States. Woe to us, the dodder is not going to kill off the knotweed, but it is quite fascinating. Cuscata spp. consist of thin twine-like stems, tinier scale-like leaves, and somewhat larger cream-white flowers. Dodder has small amounts of chlorophyll, but does not photosynthesize enough to pursue a sustainable life style. Dodder seeds that germinate must chemically sense or otherwise find host plants, then send hastoria down into the vascular systems of host plants to find their nutrition. By withdrawing nutrients and reducing host plant resistance to viruses, severe dodder infestations can reduce yields of over 100 host species including alfalfa, clover, and soybeans, and even solanaceous plants in gardens such as petunias and tomatoes. Controls involve seed quality control and plant removal, though seeds can survive for over a decade, and pre-emergent herbicides. At this Pennsylvania siting, dodder coverage was minimal and unlikely to control the Japanese knotweed. It was an interesting sight, though, especially with the potential confusion of the tiny white flowers of dodder with the tiny white flowers of knotweed. More on that later in an alert on Japanese knotweed, and even some additional potential confusion with the tiny white flowers of wild cucumber vine, Echinocystis lobata. For more on that, come to the 84th Ohio Plant Diagnostic Workshop on September 8 in Wooster (http://bygl.osu.edu/node/872). For now, let us focus on dodder, Cuscata spp., and its sometimes paradoxical and purely pleasurable alternate common names of: strangleweed, lady’s laces, wizard’s net, devil’s hair, goldthread, love vine, hellbine, angel hair, and witch’s hair. And get this, Chinese researchers are finding chemo-communications of insect predation between dodder host plants and mycorrhizal fungal connections. Whoa.